In the US, it’s National Library Week, and we love our librarians! Many of you who follow us here work in libraries or are enthusiastic library users. Let’s celebrate libraries with a few good books–because that’s who we are (even though we recognize that, today, libraries are a lot more than “just books”). 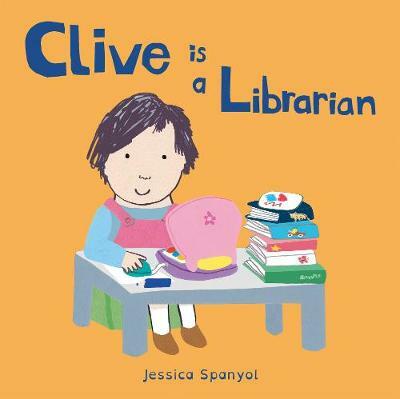 Jessica Spanyol’s board book Clive Is a Librarian, from Child’s Play, is our obvious first stop, both developmentally and in terms of straight identification. Clive demonstrates the variety of activities in which librarians take part, including making reading suggestions to visitors and arranging programming! Library staff do engage in a wide and energetic range of tasks. 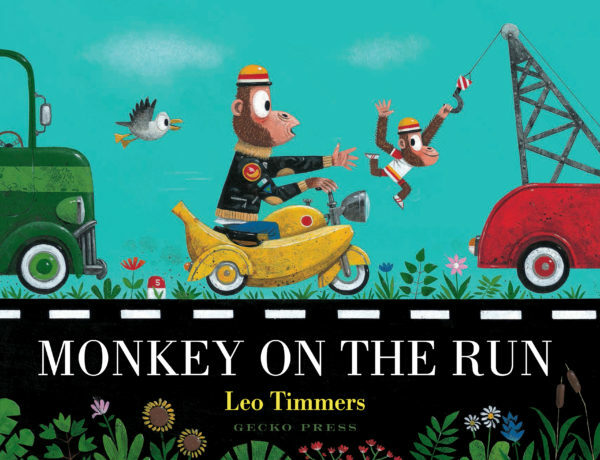 We think Gecko Press’s Monkey on the Run, by Leo Timmers, does a good job of capturing that pace and wide variation of activities! 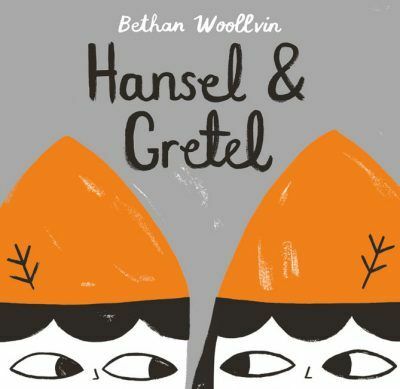 Library folks, take a break with this wordless wonder (which earned a starred review from Publishers Weekly) and we promise you’ll feel refreshed of humor as you run about your workday. 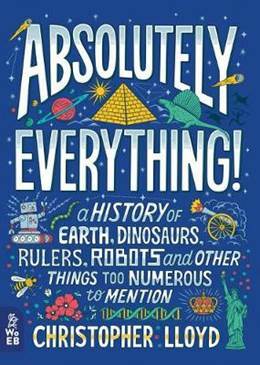 Since libraries are where we find authoritative information about just anything at all, Christopher Lloyd’s Absolutely Everything: A History of Earth, Dinosaurs, Rulers, Robots, and Other Things Too Numerous to Mention, published by What on Earth?, offers a sound reflection! Browse, skim, or plunge right in! Thank you, libraries and library staff, for keeping the informational and literary lights on! Learning language from the start through exposure to multiple languages can provide lifetime benefits. different languages by animals from the place the language is spoken. such as dancing and singing. 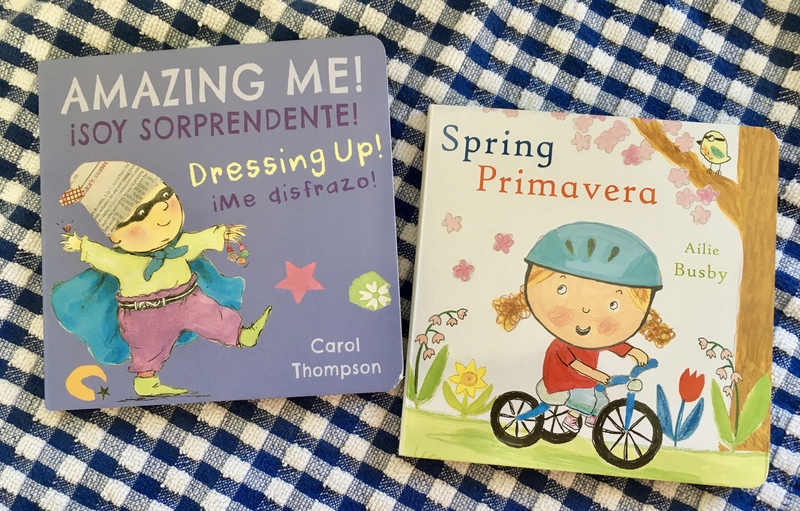 a set of four seasonal books by Ailie Busby (Spring/Primavera, and so forth) show and tell diverse children engaged in activities from dressing for the season’s weather to enjoying nature to playtime choices befitting the time of year. 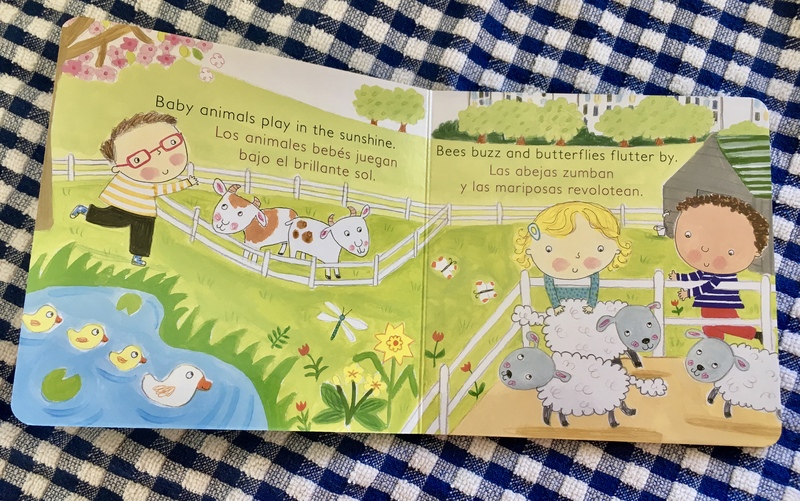 Break out of your monolingualism when you read to your little one! There are many easy ways to find a way to share how other languages talk about the day. Pi Day (3/14) approaches, so bake a pie and pull up a good book that features more fun with numbers! An award-winner from Toon Books, Ivan Brunetti’s 3 X 4 offers both a fun and fascinating look at multiplication that is accessible for readers as young as three. How many ways can you sort 12 things into even amounts? You can use socks, spoons, or other common household objects to give the ideas here a spin. As the kids in the class show, paper and crayons work well, too! 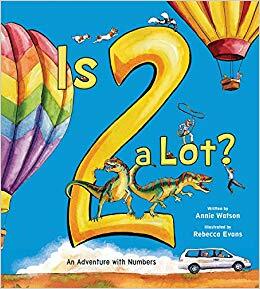 Arriving soon from Tilbury House Publishers, Is 2 a Lot?, by Annie Watson and with hilariously detailed illustrations by Rebecca Evans, explores the concept that whether an amount is a lot or not depends on the particular “what” it is counting. Two pennies may not be a lot, but two skunks in your path? That’s a lot! In addition (get it?) to ever-increasing numbers, there’s a second story happening in the illustrations here. Does the patient mother explaining whether the number in question is lot (100 snowflakes, not so much, but 100 candles on a cake is a lot) know that the road trip she and her questioning child are taking is the opportunity for her car to fill with some of the examples she’s offering? Dinosaurs! Cowboys! A knight in shining armor! A dog! People eating ice cream cones! That’s a lot of passengers! Do you need a pie recipe to put your new number sense to work on Pi Day? 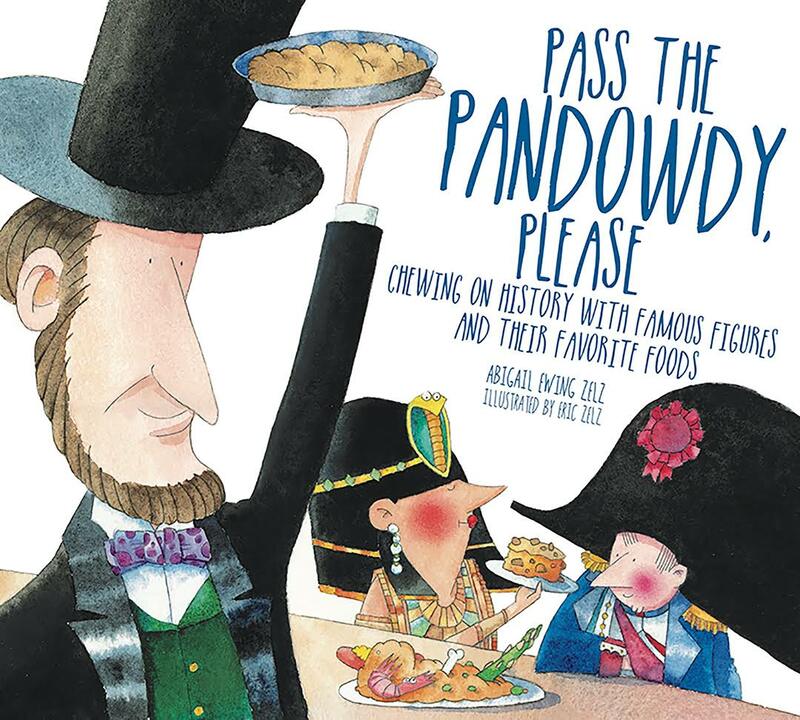 Pick up Tilbury House’s award winning Pass the Pandowdy, Please, by Eric and Abby Zelz. After your tour of foods eaten throughout history by a healthy variety of famous folk, you’ll find a recipe in the back of this book for Abraham Lincoln’s favorite pie, apple pandowdy. Happy measuring! And remember, no matter which round pie pan you use, the ratio of its circumference to it’s diameter will always be pi, or 3.14…. First celebrated after women gained suffrage rights in Russia, in 1917, International Women’s Day was recognized by the United Nations in 1975. 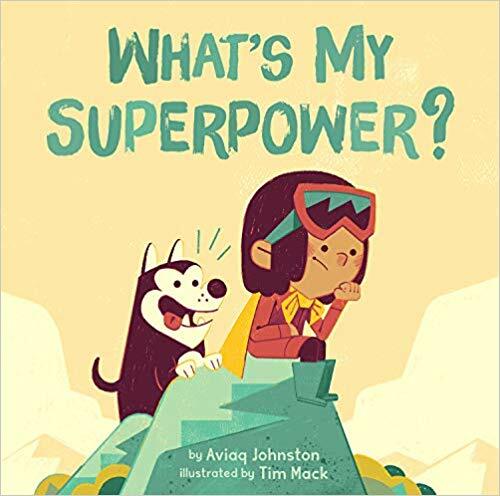 In recent years, an increasing number of books for children feature strong women and girls that make excellent stories to share with young readers. Visit your library or book store today to add to your own International Women’s Day collection with some of our favorites. From Nunavut’s Inhabit Media, celebrate with Nalvana, a little girl discovering her possibilities in What’s My Superpower? 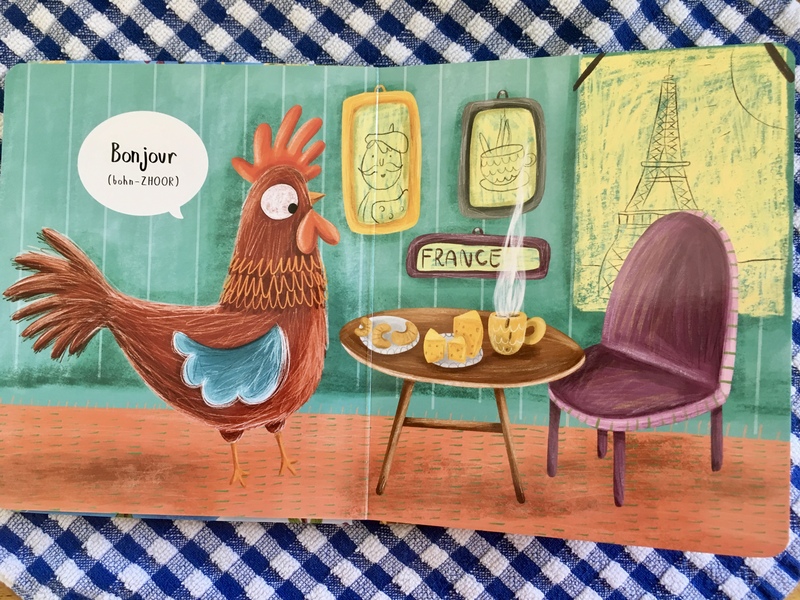 by Aviaq Johnston and with cheerful and universally appealing illustrations by Tim Mack. Nalvana’s superpower is one to which children everywhere can appreciate and aim to make their own. 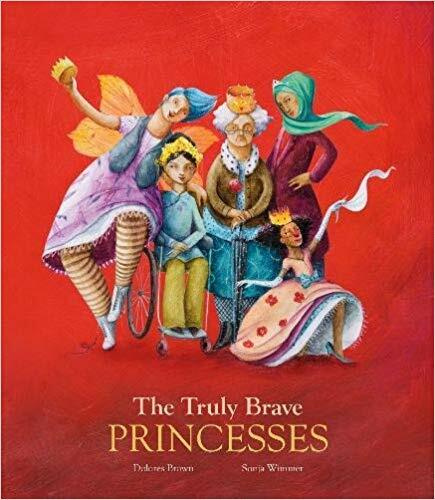 The Truly Brave Princesses, by Dolores Brown and with illustrations by Sonja Wimmer, is published by Spain’s NubeOcho in both Spanish and English versions. From astronauts to office workers, photographers and mothers, all manner of everyday “princesses” with all manner of personal styles, abilities, and challenges, surround us everywhere in both this book and in the world. 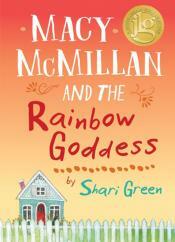 Winner of the middle grade category in the 2018 Schneider Family Book Awards, Shari Green’s junior novel Macy McMillan and the Rainbow Goddess, from Canada’s Pajama Press, provides readers with two women to celebrate: Macy herself is an Every Girl who happens to be deaf and her elderly neighbor makes magic with baked goods—the magic of friendship and support, including the support of needing help herself and thus giving Macy the opportunity to grow. 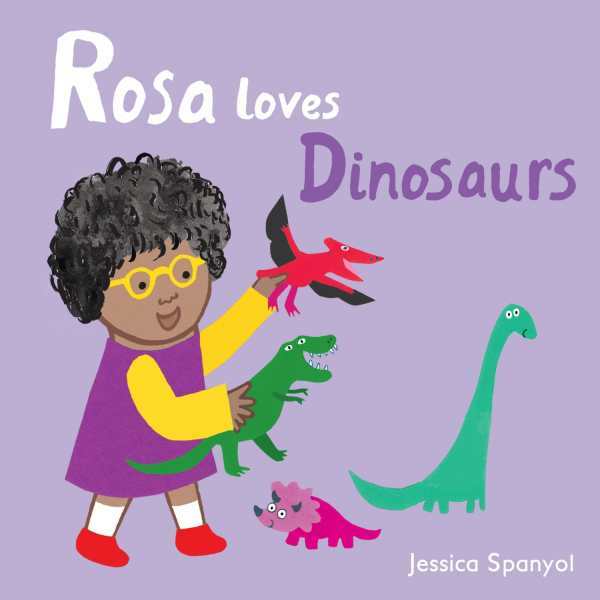 Jessica Spanyol’s board book series from British publisher Child’s Play offers the very youngest readers a series featuring Rosa. 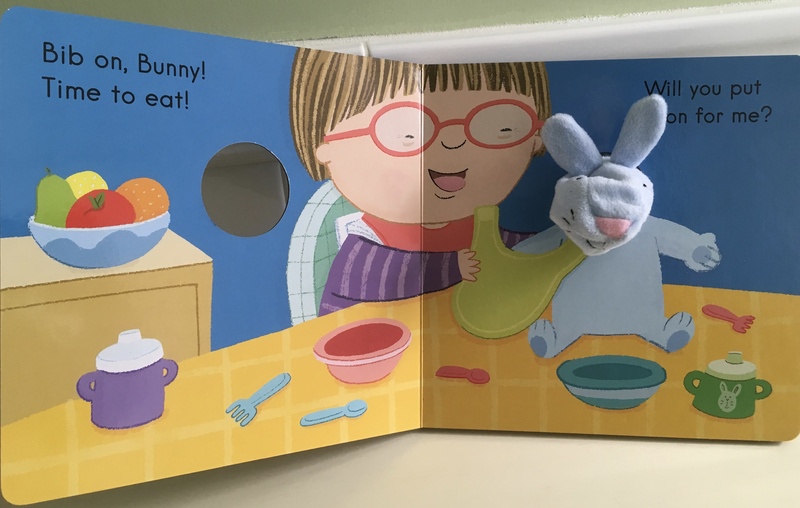 Bespectacled toddler Rosa loves dinosaurs, plays with toy trains, and is happy with her friends in a gender-free and realistic contemporary world. 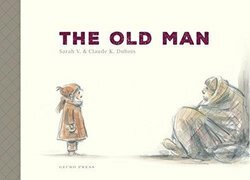 New Zealand’s Gecko Press has provided us with the Belgian picture book The Old Man, by Sarah V. and Clause K. Dubois. In a simple and accessible story that features both homelessness and the uncertain mental health of the titular character, a little girl offers significant help. This little woman’s capacity to meet people where they are, accept them, and provide what she can is inspiring for readers of all ages. 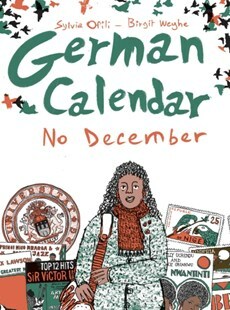 Graphic novel readers can celebrate International Women’s Day with the brand new book from Nigeria’s Cassava Republic, German Calendar No December. Sylvia Ofili and artist Bergit Weyhe provide an accessible coming of age story about a truly international girl who seeks places to fit in, eventually realizing her best fit is to be herself. May your International Women’s Day be filled with inspiration, celebration, and, as ever, great books to support the world we share. The 24thannual Audie Awards ceremony, held 4 March 2019, made one of our publishers a star—again! The Audies are the premier awards program in the United States recognizing distinction in audiobooks and spoken-word entertainment. In the category of Young Listeners, Live Oak Media was represented by two of the five finalists. Esquivel! 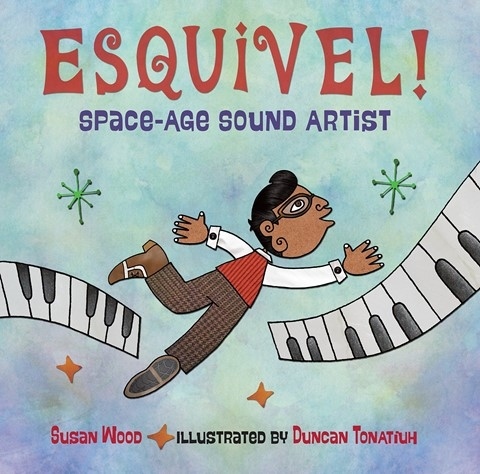 Space Age Sound Artist is a picture book introduction to Mexican musician Juan Garcia Esquivel, written by Susan Wood and illustrated by Duncan Tonatiuh, first published in print By Charlesbridge and turned by the Live Oak Media artistry and engineering into a fully soundscaped feast, read by Brian Amador, with singing by Rosi and Brian Amador. "Listeners travel back through time to explore the life of Harriet Tubman, guided by four African–American narrators. Lisa Renee Pitts, Bahni Turpin, January LaVoy, and SiSi Aisha Johnson narrate in turn to describe Tubman's voice rising in protest as a suffragist, the heroics of General Tubman, the secrecy of her work as a Union spy, all the way back to her childhood as a slave when her father taught her to read the stars. Sounds of horse-drawn carriages, marching soldiers, spirituals, and rushing rivers pair beautifully with the watercolor illustrations to help listeners imagine the many roles that Tubman played over her lifetime. The audiobook concludes with each narrator's echoing intonation of those roles, listing the many accomplishments of her life and honoring her legacy." With these two strong contenders, Live Oak Media went to the Audies 2019 ceremony with good prospects. And, indeed, they created the winning Young Listener audiobook for the year! 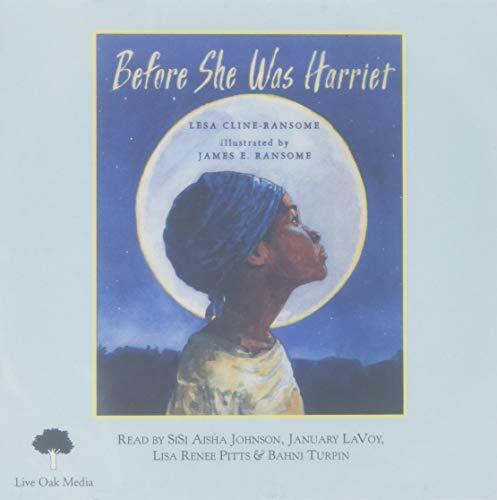 Before She Was Harriet, the full cast of highly regarded narrators (who can count many other Audie Awards across the years among them), and Live Oak Media added another medal to their recognition. You can hear a clip from the winning audiobook at the end of this AudioFile Magazine review. 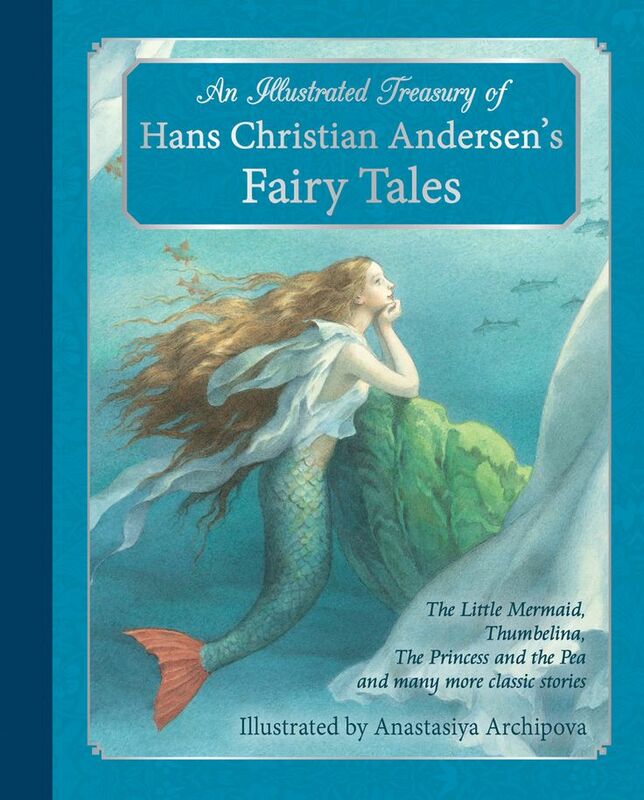 Today is National Tell a Fairy Tale Day and we have all kinds of inspiration to help you find a favorite to share. 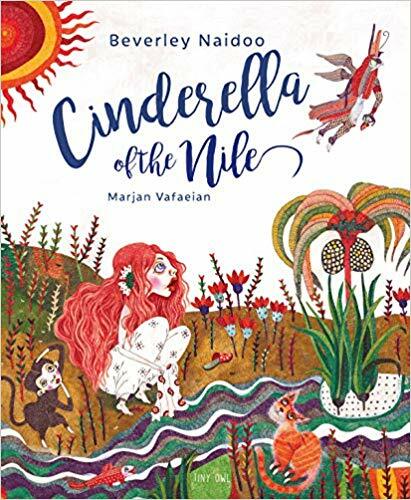 From Tiny Owl Books, you can pick up Cinderella of the Nile, as told by Beverly Naidoo and with evocative and detailed art by Marjan Vafaeian. This story has many cultural variations, with this version, part of Tiny Owl’s “One Story, Many Voices” series, based on an Egyptian tale. Peachtree Publishers, presents the familiar Grimm Brothers’ story with a twist: here we see it all from the witch’s point of view. Another nicely twisted fairy tale set-up comes from Amélie Fléchais, published in translation from French by Jeremy Melloul for Lion Forge. 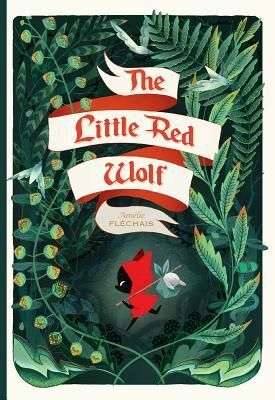 The Little Red Wolf turns Perrault’s classic tale around several times and what emerges is a delightful graphic novel for young and older to share. For a completely different take on wolfish identity, cicada Books offers Born Bad, by C. K. Smouha and illustrated by Stephen Smith. Rather than a fairy tale, this one offers a compelling backstory for the dissatisfaction felt by fairy tales’ perennial bad guy. 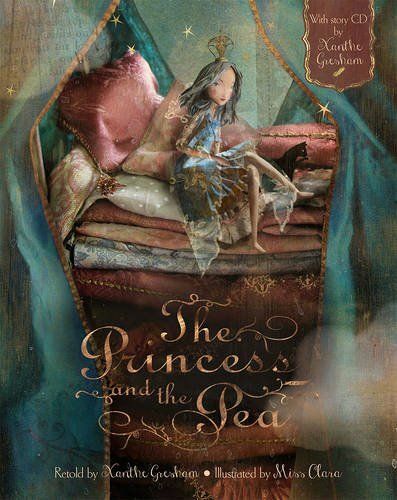 Xanthe Gresham’s retelling of Andersen’s The Princess and the Pea, published by Barefoot Books, is richly alliterative, making it a great read-aloud. The artwork here, by Miss Clara is luminous and ever-changing in styles as each successive princess takes the prince’s—and readers’—attention. An Illustrated Treasury of Hans Christian Andersen’s Fairy Tales, illustrated by Anastasiya Archipova and published by Floris Books, delivers eight fairy tale favorites, including “The Emperor’s New Clothes” and “The Snow Queen.” This edition does a good job of offering both gift-worthy elegance and accessibility by small children. Ready to get started telling a fairy tale today? What a pleasure—and a relief—to see so many picture books showing families that reflect reality! We’ve collected some of our favorite new—and not quite new—picture-driven stories that demonstrate how inclusivity can make strong storytelling ideas even better. 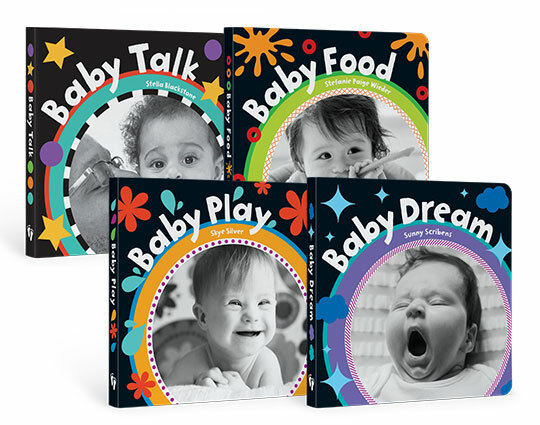 In the category of board books for the youngest family member, Barefoot Books’ Baby’s First Words, by Stella Blackstone and Sunny Scribens, and available in both English and Spanish, is a robust collection of activities and items encountered by a family of two dads and their toddler, with Christiane Engel’s colorful illustrating palette further complemented by her whimsical details, like the smiling wolf toes of Baby’s rain boots and the tooth brushing toy wooly mammoth. The dads include a bespectacled black man who appears to be the primary care giver and his partner, a white man who arrives home in time for the evening bath and bedtime rituals. In addition to nouns and active verbs, our family here encounters and names sounds, emotions, and prepositions, too. 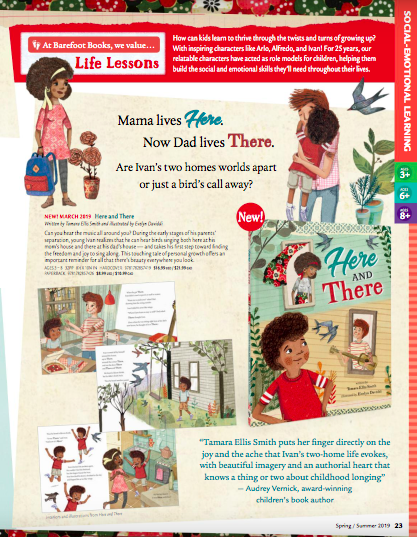 New this spring from Barefoot Books is Here and There, a picture book for ages four to eight, by Tamara Ellis Smith, with acrylic and collage illustrations by Evelyn Daviddi. In this realistic and emotionally supportive story, Ivan learns to handle visiting his father who now has a separate home from him and his mother. That Ivan’s father is shown as white and his mother as brown offers kids from newly separated homes or not an opportunity to see diversity reflected in a loving family. Although Ivan’s parents live separately, they clearly support him. Sometimes families are broken by parental death, of course. 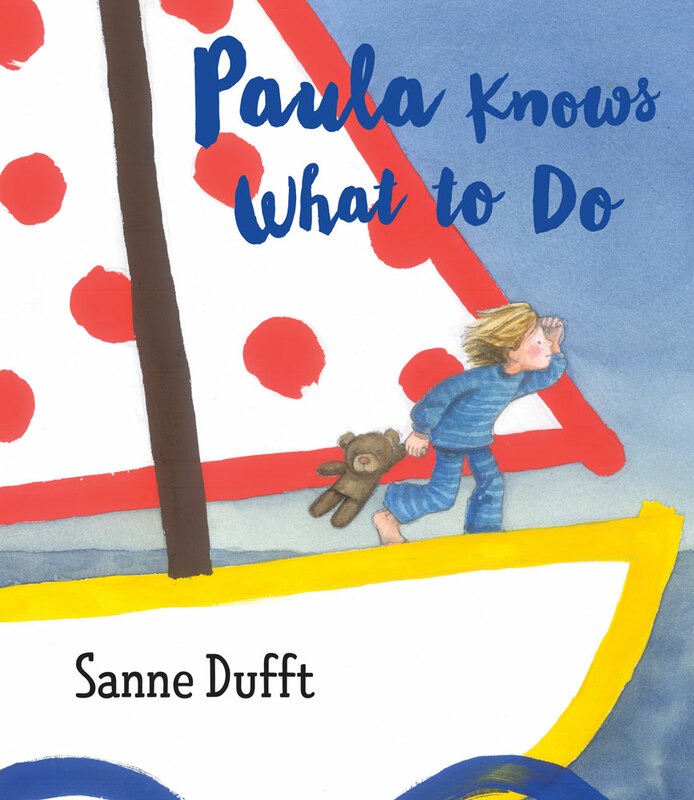 Just published by Pajama Press, the eponymous child at the center of Paula Knows What to Do, by Sanne Dufft, shows picture book readers as well as her sad dad how to cope with the moment by creating a fun-filled and distracting imaginative adventure. 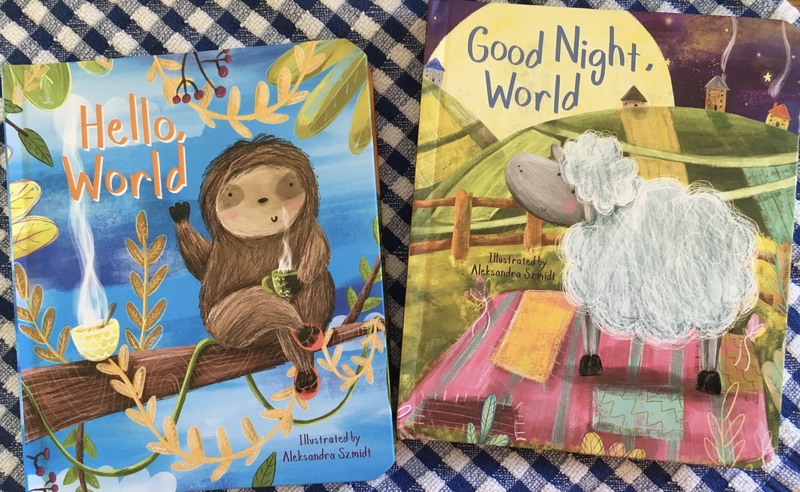 Here’s a story for three to seven-year-olds that both acknowledges grief and celebrates a child’s capacity to share her own resilience with a parent. 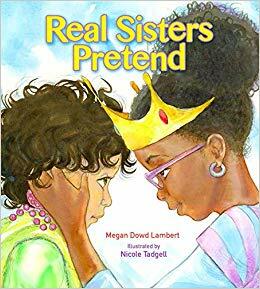 adoptive parented families are confronted by the casually cruel and ignorant assertions of some, Tilbury House’s Real Sisters Pretend, by Megan Dowd Lambert and with luminous illustrations by Nicole Tadgell, has already become a picture book classic. Instead of a parental voice explaining, lucky readers are provided a first hand experience with a helpful sister’s support when her younger sibling relays the objection an outsider has made about their family. Coming soon to American readers from Cassava Republic, Mylo Freeman’s Hair, It’s a Family Affair offers a delightful way to talk about how family members both share traits and differ in them. 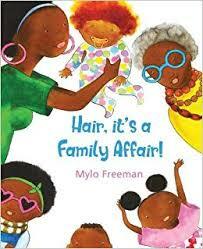 Macy tells her class all about her family members’ diverse hair styles, from her grandmother’s once big and now more conservative Afro to her baby sister’s soft hair (which is shown to be red) to her father’s bald head. As ever, the author-illustrator’s paintings are filled with jolly expressions, multi-patterned clothing, and lots of energetic actions on every page. 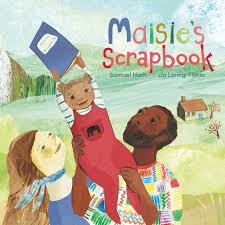 Also coming soon to the US is Lantana Publishing’s picture book Maisie’s Scrapbook, written by Samuel Narh with illustrations by Jo Loring-Fisher. This celebration of family has both traditional and less traditional elements: composed of a mother, a father, and a small child, Maisie’s family is shown sharing music, food, and other cultural expressions. Her father’s traditions, like the author’s, come from Africa, while her mother’s European heritage appears in the details of her choices of recipes, musical instrument, and even clothing material. Maisie is a lucky child to be showered with much cultural bounty as well as parental love. We’re delighted to hear that so many of our books have received attention from The Nature Generation’s national Green Earth Book Award long list selectors! Now celebrating its 15thyear, this award directs attention to books for children and young adults that provide environmental themes and excellent storytelling. There are 68 titles on the long list, including picture books, children’s fiction, children’s nonfiction, young adult fiction, and young adult nonfiction. Publishers include large trade houses, specialized presses, university publishers, and independents. 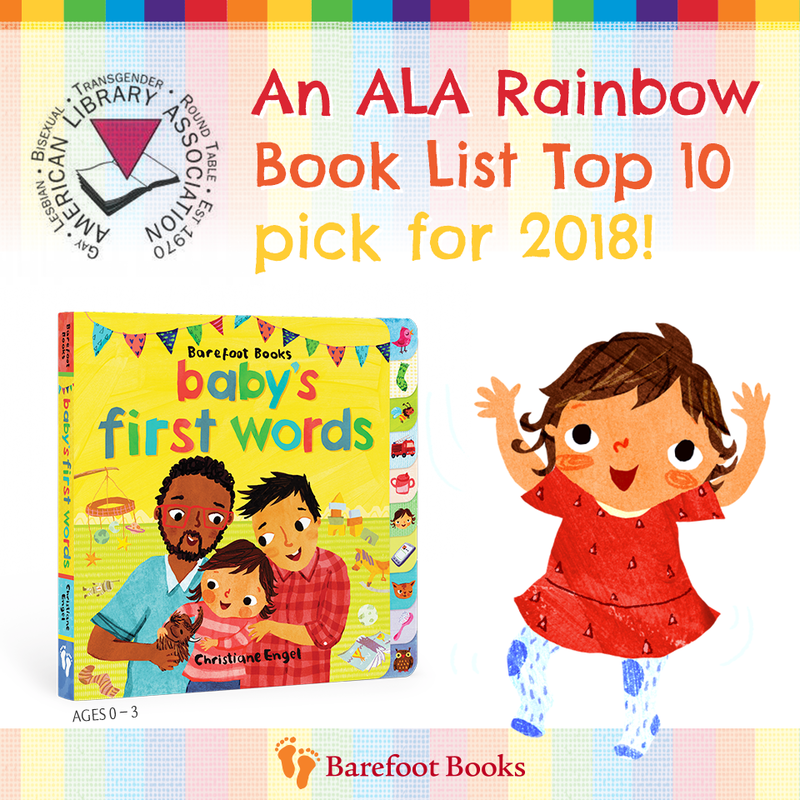 A tenth of that list comes from our clients, who are represented in the categories for picture books, children’s fiction, and children’s nonfiction. Short lists will be revealed in March and final announcement of the awards takes place in April. 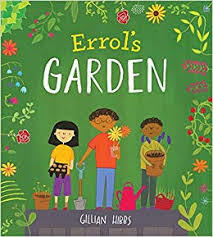 Errol’s Garden, written and illustrated by Gillian Hibbs and published by Child’s Play International, offers urban children a picture book model hero who finds ways to expand his food gardening in a densely built neighborhood. 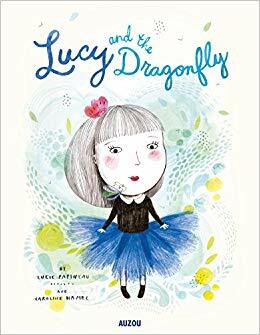 Lucy and the Dragonfly, written by Caroline Hamel, illustrated by Lucie Papineau and published by Auzou, shows and tells picture book readers the story of girl who identifies with the Earth’s environmental decay and is cheered by actions taken to restore nature. 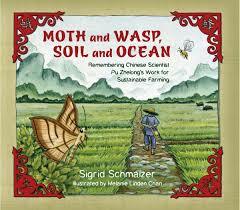 Moth and Wasp, Soil and Ocean: Remembering Scientis Pu Zhelong’s Work for Sustainable Farming, written by Sigrid Schmalzer, illustrated by Melanie Linden Chan and published by Tilbury House Publishers appeals to picture book reading children as well as older readers through adult, as it shows and tells the story of Chinese Pu Zhelong from farmboy to researcher. 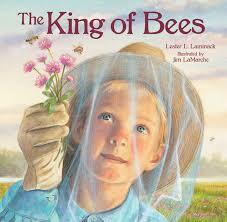 The King of Bees, written by Lester L. Laminack, illustrated Jim LaMarche and published by Peachtree Publishers provides an inside look at the operations of a bee farmer and the social lives of honeybees. 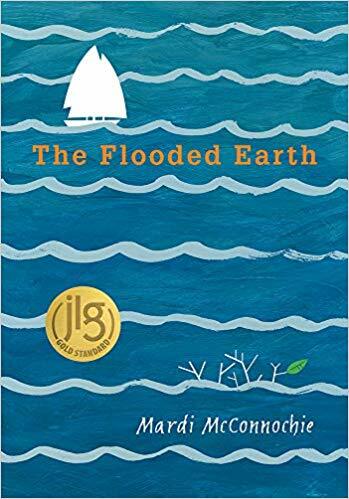 The Flooded Earth, written by Mardi McConnochie and published by Pajama Press gives middle grade readers an age- appropriate climate fiction dystopia filled with adventure and character development that will leave readers on the lookout for its sequel (publishing this year). 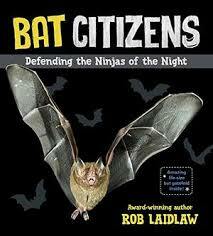 Laidlaw and published by Pajama Press combines information about these “ninjas of the night” with activities kids have undertaken to assure bats safe environments in our changing world. published by Cicada Books shares the architectural artist’s passion for gardening and shows how people can support trees’ and forests’ health. We’re delighted to help you celebrate International Book Giving Day this Valentine holiday! Better than flowers, more accessible than chocolate, and sure to warm the hearts of both giver and recipient, there are warm-hearted books for everyone in your life. From Auzou Publishing our friend Wolf offers a perfect tie-in to the traditional February 14 celebration. 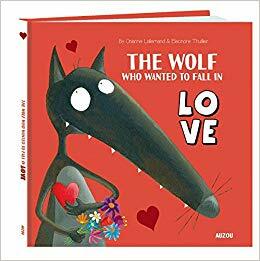 The Wolf Who Wanted to Fall in Love offers bright images and a heartfelt story that features author Orianne Lallemand and illustrator Éléonore Thuillier series hero on a quest for that special relationship. 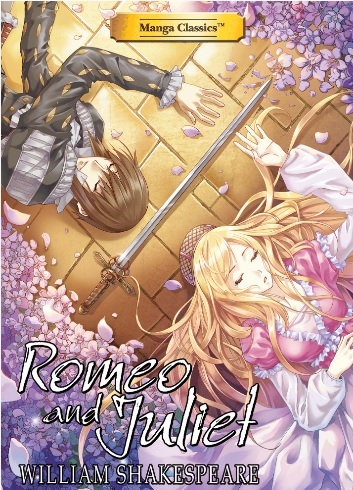 Another series offering just the right tale for Valentine’s Day is Manga Classics rendition of William Shakespeare’s Romeo and Juliet. The whole story is here, adapted by Crystal C. Chen and lushly imagined with art by Julien Choy. 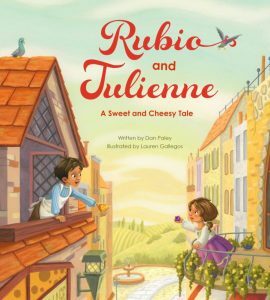 For a different approach to Shakespeare’s romantic tale, younger book recipients can delight in Tilbury House’s witty Rubio and Julienne: A Sweet and Cheesy Tale, by Dan Paley with illustrations by Lauren Gallegos. Be sure to stock up on cheese and some fruit to nibble when you share this one because the back matter will guide you into creating a treat to share all around. 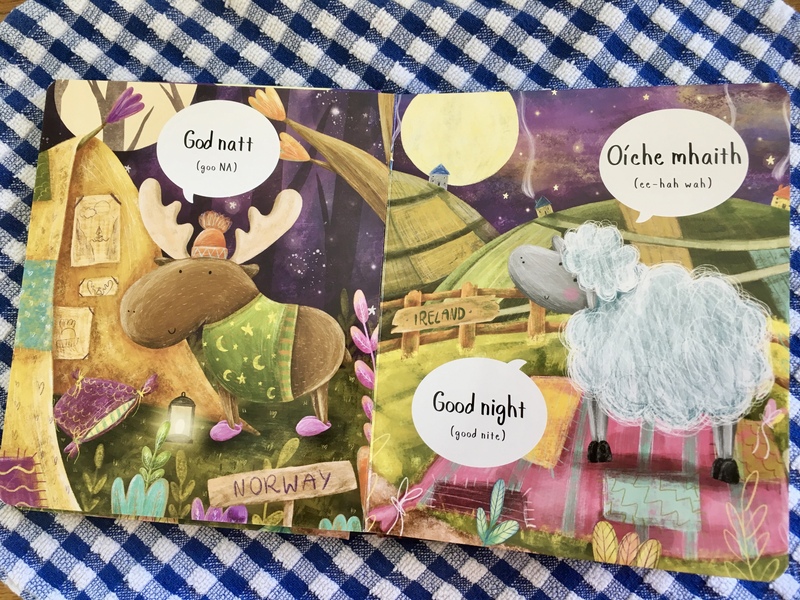 How about some poetry to share with your little book lover? 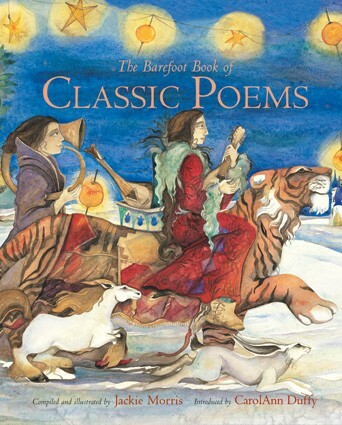 Barefoot Books offers a volume of Classic Poems for language lovers of all ages. Verses from William Blake, Rachel Field, and Ogden Nash are featured, along with writers more frequently connected with children’s writing, such as A. A. Milne and Robert Louis Stevenson. 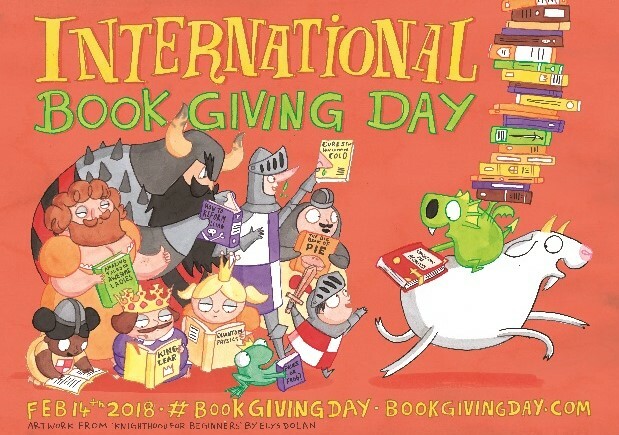 Celebrate International Book Giving Book today. Your Valentine will love you for it. 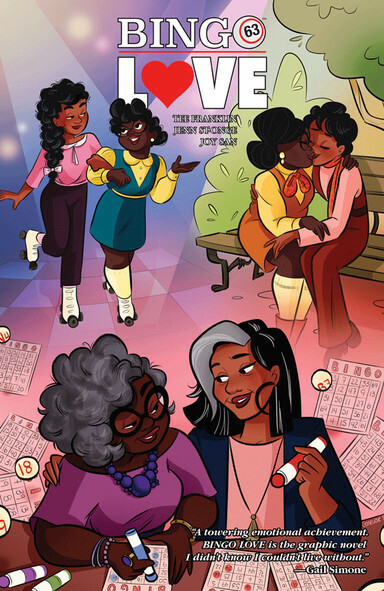 And you might want to pick up Image Comics’ Bingo Love by Tee Franklin, Joy San and Jenn St-Onge for yourself and your older Valentine! Let’s make a habit of giving books beyond just today.